“Carnage”—director Roman Polanski’s take on the Tony Award-winning play "God of Carnage" by Yasmina Reza, now being staged at Performance Network—is a razor-sharp comedy centered on parental differences. After a playground fight, the victim’s parents invite the bully’s parents over to work out their issues. A polite discussion of child rearing soon escalates into verbal warfare, with the parents revealing their true colors. The film stars Kate Winslet, Jodie Foster, Christoph Waltz and John C. Reilly. Mark Kennedy of the Associated Press says, “A nasty spat between two couples over the course of an evening may not sound like a fun flick, but like any act of carnage, it's hard to turn away.” “Carnage” opens Friday at the State Theatre. "Beauty and the Beast 3D" captures the fantastic journey of Belle (voice of Paige O'Hara), a bright and beautiful young woman who's taken prisoner by a hideous beast (voice of Robby Benson) in his castle. Charles Solomon of the Los Angeles Times says, “It's a pleasure to see "Beauty and the Beast" again in a theater with an audience that laughs and cries, but most of those pleasures would be just as evident in a conventional presentation.” "Beauty and the Beast 3D" opens Friday. In “Joyful Noise,” the small town of Pacashau, Georgia, has fallen on hard times, but the people are counting on the Divinity Church Choir to lift their spirits by winning the National Joyful Noise Competition. The choir has always known how to sing in harmony, but the discord between its two leading ladies now threatens to tear them apart. Their newly appointed director, Vi Rose Hill (Queen Latifah), stubbornly wants to stick with their tried-and-true traditional style, while the fiery G.G. Sparrow (Dolly Parton) thinks tried-and-true translates to tired-and-old. Shaking things up even more is the arrival of G.G. 's rebellious grandson, Randy (Jeremy Jordan). Randy has an ear for music, but he also has an eye for Vi Rose's beautiful and talented daughter, Olivia (Keke Palmer), and the sparks between the two teenagers are causing even more heat. “Joyful Noise” opens Friday. “Contraband” stars Mark Wahlberg as Chris Farraday, a man who long ago abandoned his life of crime, but after his brother-in-law, Andy (Caleb Landry Jones), botches a drug deal for his ruthless boss, Tim Briggs (Giovanni Ribisi), Chris is forced back into doing what he does best—running contraband—to settle Andy's debt. Chris is a legendary smuggler and quickly assembles a crew with the help of his best friend, Sebastian (Ben Foster), for one final run to Panama and back, hoping to return with millions in counterfeit bills. “Contraband” opens Friday. a movie that anticipates 'Blade Runner' in its meditation on artificial and human intelligence and 'The Matrix' in its conception of reality as a computer-generated illusion.” “World on a Wire” screens on Saturday, Jan. 14 at the Michigan Theater at 10 p.m. In “Who Framed Roger Rabbit?” cartoon star Roger Rabbit is worried that his wife Jessica might be playing pattycake with someone else, so the studio hires detective Eddie Valiant to snoop on her. But the stakes are quickly raised when Marvin Acme is found dead and Roger is the prime suspect. Featuring groundbreaking interaction between the live and animated characters, and lots of references to classic animation, “Who Framed Roger Rabbit” plays the State on Saturday, Jan. 14 at 11:59 p.m.
“Beyond the Bricks” is a media project and national community engagement campaign that seeks to promote solutions for one of America's critical problems in education: the consistently low performance and graduation rates of school-age Black males. The film follows African-American students Shaquille Ingram and Erick Graham as they struggle to stay on the track in the Newark, NJ public school system. Weaved into the boys' stories is commentary from some of the country's foremost leaders, experts and scholars focused on black boys and their education including Newark Mayor Cory Booker, the Rev. Al Sharpton, Schott Foundation President John Jackson, Pedro Noguera, Ivory Toldson, and others. “Beyond the Bricks” plays Monday, Jan. 16 at 2 p.m. Looking forward to seeing Carnage. Thu, Jan 12, 2012 : 7:03 p.m.
Contraband looks like the movie to see!! Thu, Jan 12, 2012 : 6:20 p.m. I'm so grateful to have been a kid when I was - &quot;Who Framed Roger Robert?&quot; is genius. I am really going to try and make this showing on Saturday. I have been waiting to see the movie Contraband, from the trailers it looks very interesting. Mark Wahlberg has done some great films in the past and am interested to see how he does in this movie. Thu, Jan 12, 2012 : 5:03 p.m.
Haven't seen Roger Rabbit since its original run. Super excited to see it on the big screen again, this time as an adult! Thu, Jan 12, 2012 : 4:33 p.m. Looking forward to seeing how &quot;Carnage&quot; compares to the stage show, which I just watched last night at Performance Network. The actors have so much fun with each other on stage. Thu, Jan 12, 2012 : 3:50 p.m. I've heard Carnage is very good, so I'd like to see that. I was able to see Joyful Noise, Contraband, and Beauty and the Beast 3D at screenings and I recommend all of them. The Tangled short before Beauty and the Beast is cute, too. Thu, Jan 12, 2012 : 3:30 p.m.
Thu, Jan 12, 2012 : 3:28 p.m.
Thu, Jan 12, 2012 : 2:36 p.m. 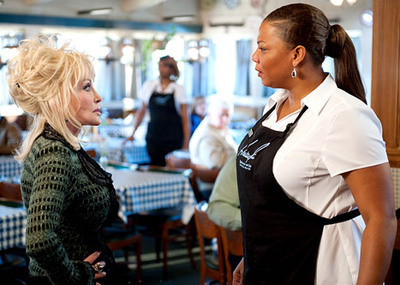 I can't wait to see the new Dolly Parton &amp; Queen Latifah movie! I love the name too...&quot;Joyful Noise&quot; is another name for what you hear coming out of my house.